47 C.F.R. §73.317(a): “FM broadcast stations employing transmitters authorized after January 1, 1960, must maintain the bandwidth occupied by their emissions in accordance with the specification detailed below. FM broadcast stations employing transmitters installed or type accepted before January 1, 1960, must achieve the highest degree of compliance with these specifications practicable with their existing equipment. In either case, should harmful interference to other authorized stations occur, the licensee shall correct the problem promptly or cease operation.” The eighth harmonic of Station WKZE-FM (784.8 MHz) was causing interference to the Verizon Wireless transmitter located approximately 500 feet away. First off, we note that the WKZE transmitter is not allegedly causing interference to a Verizon Wireless transmitter, but rather to a Verizon Wireless receiver. That may be splitting hairs, however, since the FCC is quoting a technical rules violation, they can at least get the technical language right. (d) Any emission appearing on a frequency removed from the carrier by more than 600 kHz must be attenuated at least 43 + 10 Log10 (Power, in watts) dB below the level of the unmodulated carrier, or 80 dB, whichever is the lesser attenuation. Since 784.8 MHz – 98.1 MHz is greater than 600 KHz, this is the section that applies to the WKZE situation. Thus, the interfering signal must be greater than -80 dBc to trigger the Notice Of Violation (NOV) from the FCC. The station ERP is 1,800 watts or +62 dBm. Measurements were made with a an Agilent N992A spectrum analyzer using an LPA-1000 log periodic antenna. At a 12 foot distance away from the WKZE transmitter cabinet, the signal on 784.8 MHz was found to be -94 dBc or 0.000063 watt. At the base of the Verizon Wireless tower, the measurement was -124 dBc, or 0.000000025 watt, which is barely perceptible above the -130 dBm noise floor. There does not appear to be any violation of 47 CFR 73.317. Rather, the issue seems to be Verizon Wireless’s deployment of 700 MHz LTE band and the use of high gain antennas coupled with high gain preamplifiers on frequencies that are harmonically related to broadcast stations nearby. In this particular installation, the antenna has 16 dB of gain, minus a 4.5 dB of transmission line loss into a 21 dB preamplifier before the receiver. At the output of the Verizon preamplifier, the signal on 784.8 MHz was measured at -89 dBc, which is still in compliance. By these measurements, clearly WKZE is not in violation of any FCC regulation. It makes one wonder, does the FCC understand it’s own rules? Or, is this a matter of favoritism towards a huge corporation over a small independent radio broadcaster. Is it a matter of “broadband at the expense of all others?” There are several of these broadcast to 700 MHZ LTE interference cases pending throughout the country. This could set a dangerous precedent for broadcasters and other RF spectrum users as wireless giants like Verizon throw their weight around and eye even more spectrum to press into broadband service. Commlaw blog has a good post this subject: Harmonic Convergence? Update: Response from WKZE attorney can be found here, includes the above mentioned actual measurements. 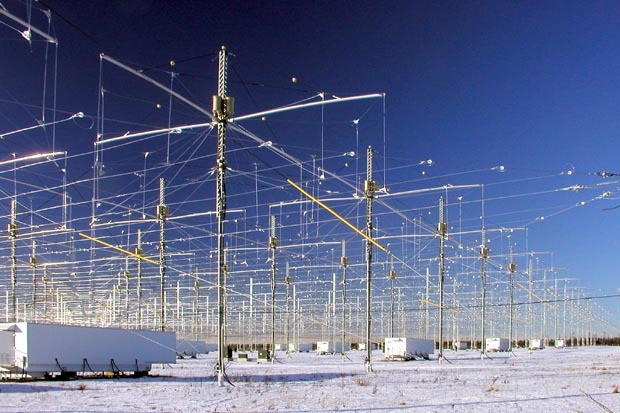 The proximate cause of HAARP’s early May shutdown was less fiscal than environmental, (James) Keeney said. As he explained it, the diesel generators on site no longer pass Clean Air Act muster. Repairing them to meet EPA standards will run $800,000. Beyond that, he said, it costs $300,000 a month just to keep the facility open and $500,000 to run it at full capacity for 10 days. Which, ouch! It looks like they generate all their own power on site with diesel generators, which is not inexpensive. Still, it is an interesting looking facility and it would be fun to poke around a bit. As the above quoted article says, the site will likely be bulldozed unless some other funding to operate the array is found. As a result of this, I fully expect that there will be no more hurricanes, earthquakes, tsunamis, tornadoes and so on.